While children will be participating in a Washington tradition next week rolling Easter eggs on the White House lawn, anti-war and human rights activists will be inviting others to join in an unusual new activity: an Easter cluster-bomb hunt. Fake cluster bombs made by children will be scattered around Lafayette Park, north of the White House. The colorful objects represent the deadly ordnance that releases several hundred smaller bombs that might explode or linger on the ground as land mines. They are often found and picked up by children, who are attracted by their small size, shape and bright colors, activists say. "Obviously, we're trying to spoof a little bit what will be happening on the South Lawn," Brian Hennessey of the Vineeta Foundation, the lead sponsor of the cluster-bomb hunt, told The Washington Post. "We're not trying to hit kids over the head with this; we want them to have fun. We also want to bring attention to the fact that our munitions cause a lot of death and destruction to civilians, especially children." While thousands of civilians have been killed or maimed by such weapons, they pose a hazard to the military as well. Unexploded U.S. cluster bomblets in Iraq have killed or injured at least eight U.S. troops, as reported by USA Today, and unexploded bomblets in Afghanistan have hampered mine-sweeping operations and slowed military actions against the Taliban. According to the Red Cross, dormant bombs left in southern Lebanon by Israeli forces last year have caused more than 200 deaths and injuries in the months since Israel withdrew. 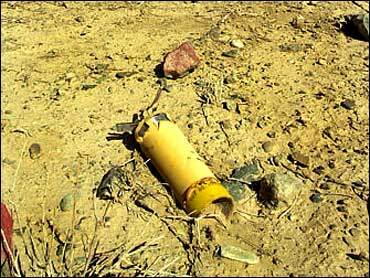 In February 46 nations adopted a declaration calling for a treaty banning cluster bombs by 2008. The treaty would "prohibit the use, production, transfer and stockpiling of those cluster munitions that cause unacceptable harm to civilians," the declaration said. The U.S., China and Russia have refused to sign a land mine treaty and oppose the initiative on cluster bombs. Other event co-sponsors include the Coalition for Justice and Accountability, Voters for Peace, and Code Pink.